Potentially serious if left untreated, dehydration and overheating can be prevented by recognizing early warning signs. While field dogs are especially vulnerable, these conditions can impact all dogs. A excess loss of body fluids, dehydration involves the loss of water and depletion of electrolytes, which include the essential minerals of potassium, sodium and chloride. Signs of a dehydrated dog include sunken eyes and dry mouth, gums and nose. Poor skin elasticity is another dehydration symptom, which you can test by gently pulling up on the skin at the back of your dog’s neck. If the skin doesn’t immediately spring back to its normal position, your dog may be dehydrated. The longer it takes for the skin to return to its normal position, the more severe the dehydration. You can perform another at-home dehydration test by checking your dog’s mouth for capillary refill time. Press your finger against your dog's gums until they turn white, then remove it. If the gums don’t regain color immediately, your dog could be dehydrated. Since untreated dehydration can lead to organ failure and death, seek immediate medical attention if dehydration is suspected. Depending on the severity, your vet may suggest water with electrolyte products. In extreme cases, intravenous fluids will be administered to replenish your dog's fluids. Heat-related canine conditions can also become life-threatening without immediate treatment. Overheated dogs can suffer heat exhaustion, heat stroke or sudden death from cardiac arrhythmias. Panting, followed by disorientation and fast, noisy breathing could signal overheating. Other possible signs: Collapsing or convulsing, bright red or blue gums, vomiting and diarrhea. Since field dogs are unlikely to stop hunting or retrieving when they become dangerously hot, owners should watch their dog closely for overheating signs. If you suspect your field dog or other dogs are overheated, wet him with cool tap water before heading to the veterinarian. Let the office know you’re on the way, so a team can be prepared to act quickly. Your vet may apply alcohol to the ears, foot pads and groin to safely lower the temperature, as well as administer cool IV fluids. For serious overheating, your dog may need a breathing tube and artificial ventilation. Depending on the severity of symptoms, correcting electrolyte imbalances and controlling seizures may also be needed. If organ damage is suspected, hospitalization may be required. Simple precautions can ward off dehydration and overheating. 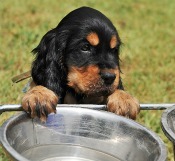 To help prevent dehydration, offer field dogs water at least hourly, experts advise. Many enjoy hunting so much they run until collapsing, so owners should watch closely to know when their dog has had enough. Wobbliness, weakness or collapse are signs to provide shade and offer small amounts of water. If your dog doesn’t improve, seek immediate veterinary attention. To prevent overheating, help your dog beat the heat by encouraging resting and drinking at his leisure. For field dogs, deep, fast-moving lakes, ponds and rivers may be available to provide fresh, cool water. Allow your dog to submerge his body to siphon off the building heat.